As a scalable platform with nearly limitless customization options, PinnacleCart is an inspired choice for online stores of all sizes and webmasters of all skill levels. Though it doesn’t receive as much attention as some of its competitors, PinnacleCart is an amazingly versatile shopping cart platform that offers something for every online business. Inexperienced users will appreciate the user-friendly drag-and-drop builder while more advanced users will enjoy using the flexible Cart Designer, which allows them to edit their site’s code and upload custom files. Small businesses can save money with an affordable starter plan while enterprise businesses can manage their entire empire with dedicated hosting and a virtual private network. PinnacleCart has nearly a dozen plans to suit all types of businesses and needs. Plans for small businesses start at only $29.95 per month, and there’s a 14-day free trial that doesn’t require a credit card. For massive businesses with thousands of products and millions of monthly visitors, PinnacleCart offers custom plans that are equipped to meet the user’s needs while maintaining 99.99% uptime. In addition to accommodating businesses of all sizes, PinnacleCart has enough tools to satisfy most business needs. Users can edit a site’s HTML and CSS using the Cart Designer, although this isn’t necessary for users who just want to keep it simple. Even without touching the code, a user can personalize the colors, fonts, and configuration of their layout. They can customize their images with features like Zoom, Lightbox, and Magnify. They can even add QR codes and install third-party applications. The platform allows unlimited product images, and it’s easy for a user to add gift certificates, promotions, free shipping, and recommended product listings. Email marketing is easy with the native MailChimp integration, and products can even be listed on Amazon, Google, Facebook, Shopzilla, and other platforms. PinnacleCart is one of the easier ecommerce platforms to use. Signup requires only an email address and a phone number, and no credit card is necessary up front. Upon signing up, the user need only choose one of the high-quality templates to establish a layout for their online storefront. The next step is to enter a few basic details like the store address, social media addresses, and general company information. The user is also prompted to upload a company logo, although this isn’t mandatory. Once the Quick Start Guide is complete, the user is taken straight to the SEO page. 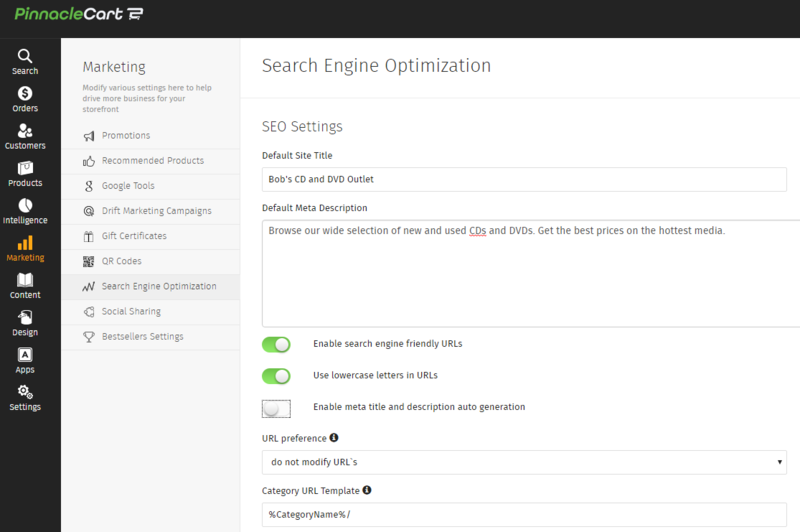 This is a great touch, because it allows the user to immediately start optimizing their search engine rankings. After entering URL preferences, meta tags, and a few other simple details, it’s straight to the dashboard. That’s where the real fun begins. All of the editing commands are conveniently located in the left column of the dashboard. Most of the website-building features can be accessed by clicking the “Design” button. 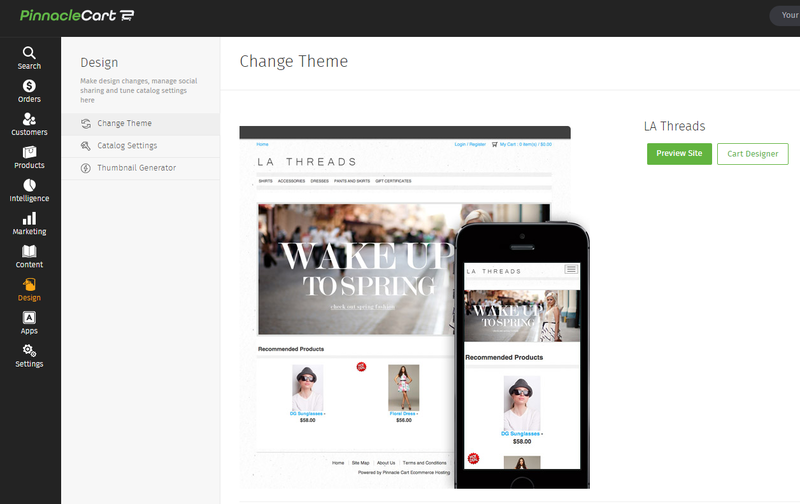 To edit the HTML and CSS, click the “Cart Designer” button that appears on the “Design” page. To add a product, click “Products” from the left column. Then, click “Add Product.” To add a new web page, click “Content” To add some specialized marketing tools, just click “Apps” and proceed to the App Center. Everything is laid out clearly and simply, and everything is easy to find. PinnacleCart is compatible with dozens of popular payment gateways, including First Data, Intuit, Stripe, Chase Paymentech, and PayPal Payments. Although PinnacleCart charges no transaction fees, each merchant will have its own payment structure, so it’s important to compare options before choosing one. PayPal Payments is a good option for users who want to accept credit cards without paying a monthly fee, but the other merchants have their own perks as well. The user also sets the shipping preferences and can choose between free, flat rate, and calculated shipping. All credit card transactions are secured by PinnacleCart’s PA-DSS / PCI compliance. This means that transactions can be completed securely and contain The Payment Card Industry Data Security Standard set of security standards.PinnacleCart is one of the few shopping cart platforms that offers this level of security to all of its customers. 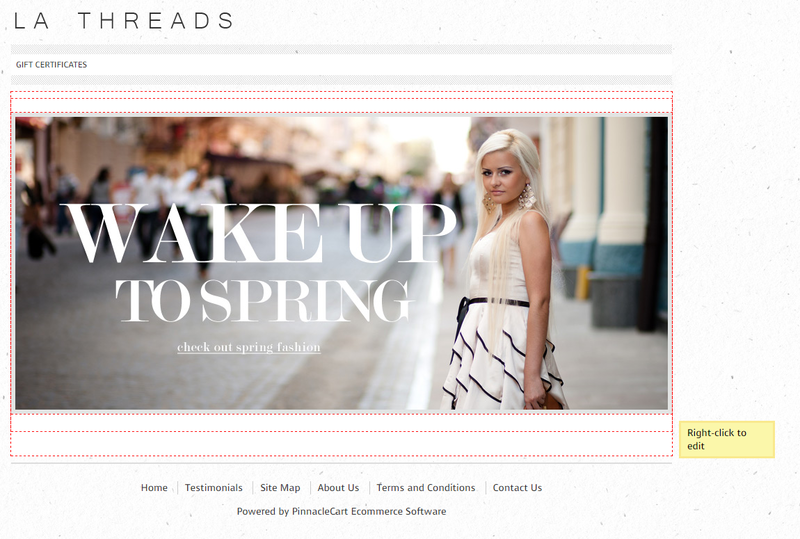 SEO is where PinnacleCart truly shines. An XML sitemap and robots.txt file are auto-generated for every site, which makes it easier for search engines to crawl the pages and content. PinnacleCart also uses SEO-friendly URLs and breadcrumb navigation, and the user can customize the title tag, meta description, meta keywords, and alt image information on every page. PinnacleCart takes user security very seriously. In addition to offering PA-DSS / PCI compliance for credit card transactions, they offer SSL certificates for improved website encryption and protection against hackers. SSL certificates are available from leading providers including Rapid SSL, GeoTrust, Thawte, and Symantec. Prices vary based on the provider and security level, but a budget SSL certificate will only cost an additional $14.95 per month. The added security is definitely worth it, and these certificates are easy to install using the platform’s one-click process. PinnacleCart also offers virtual private servers and even dedicated servers for greater security. These are usually best for enterprise businesses as the cost may be high for smaller stores. These plans are usually worth the investment for those larger companies that can afford it, though, as a VPS plan includes up to 100GB of disc space and 400GB of bandwidth. Compare that with the 1GB of storage and 2GB of bandwidth that come with a Start Up plan, or the 10GB of storage and 20GB of storage that come with the Entrepreneur plan. The company definitely needs some work in the customer service department. While many of their top competitors are now offering round-the-clock phone assistance to users at all membership levels, PinnacleCart still limits their live tech support to standard business hours (Monday-Friday, 6 a.m. to 5 p.m. Arizona time). Live chat is available weekdays until midnight and Sundays between 3 p.m. and midnight. 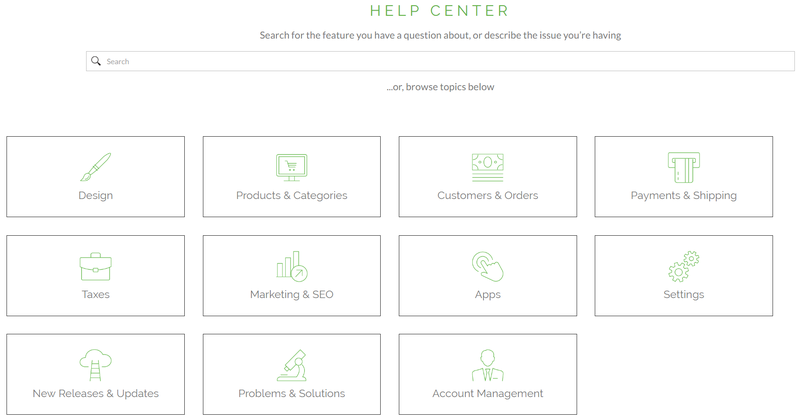 To the company’s credit, there is a 24/7 emergency support option.A user need only submit a ticket on the website and select the “Urgent” option. This feature is only permitted when the user’s website is down and they are unable to transact business. Also, since tickets are submitted online, response times may vary. 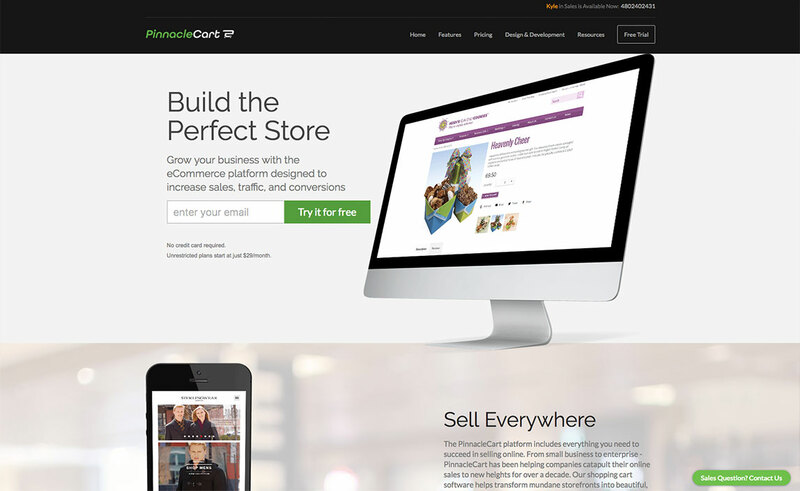 With its easy-to-use website builder, versatile shopping cart features, and scalable pricing structure, PinnacleCart is an impressive little platform. It could benefit from more flexible customer service hours, and the limited selection of templates is a bit of a disappointment, but most users should find the array of features more than suitable. Just about everything is customizable from the layout to the payment merchants to the shipping options. While PinnacleCart is a bit pricey for its lower-level plans, the features make it all worthwhile. Users are essentially gaining access to an enterprise-level toolbox at an entry-level price. Anyone who’s still unsure about the investment can sign up for the 14-day free trial and decide for themselves if PinnacleCart is the way to go. Since the free trial doesn’t require a credit card, the whole process is hassle-free. Based in Phoenix, AZ, PinnacleCart is committed to providing flexible, user-friendly ecommerce options to stores of all sizes. The company was founded by a group of internet entrepreneurs who wanted to devise a solution that caters specifically to online marketers. Today, their customer base spans to nations all across the world.